VANCOUVER, BRITISH COLUMBIA--(Marketwired - July 14, 2016) - Skyharbour Resources Ltd. (TSX VENTURE:SYH)(OTCBB:SYHBF)(FRANKFURT:SC1N) (the "Company") is pleased to announce the signing of an agreement with Denison Mines Corp. (TSX:DML)(NYSE MKT:DNN) ("Denison") that grants the Company an option to acquire a 100% interest in the Moore Lake Uranium Project ("Option Agreement"). The 35,705 hectare Moore Lake Project is an advanced uranium exploration property strategically located in the eastern portion of the Athabasca Basin region, which is known for its large scale and high grade uranium deposits and producing uranium mines. Previous exploration efforts on the property discovered high grade uranium mineralization highlighted by drill hole ML-61, which intersected 4.03% eU3O8 over 10 metres at the Maverick Zone. The depth to the unconformity on the property is relatively shallow and significant additional discovery potential remains over several conductive trends. 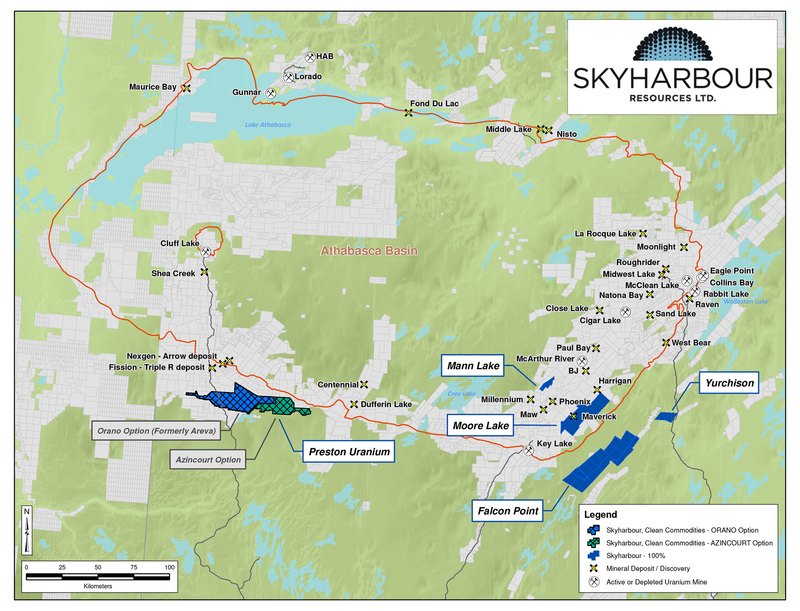 Skyharbour's President and CEO, Jordan Trimble commented, "We are very pleased to have reached an agreement with Denison to acquire up to a 100% interest in Moore Lake, as this is a transformational deal for Skyharbour. Uranium properties with the pedigree and potential of Moore Lake are few and far between. The project has extensive historical exploration, high grade mineralized results including 4.03% eU3O8 over 10 metres, and several shallow exploration targets that remain with the potential to generate further discoveries. With a recovery in the uranium market on the horizon, Skyharbour views this transaction as a unique opportunity to acquire a prime exploration property before the next uranium bull cycle begins. Having Denison onboard as a strategic shareholder and David Cates joining our Board of Directors serves to bolster Skyharbour's profile and access to capital markets moving forward. We believe this is a highly accretive deal for the Company's shareholders as we add a high grade uranium property with strong exploration upside potential to our portfolio to complement our other uranium projects in the Basin." 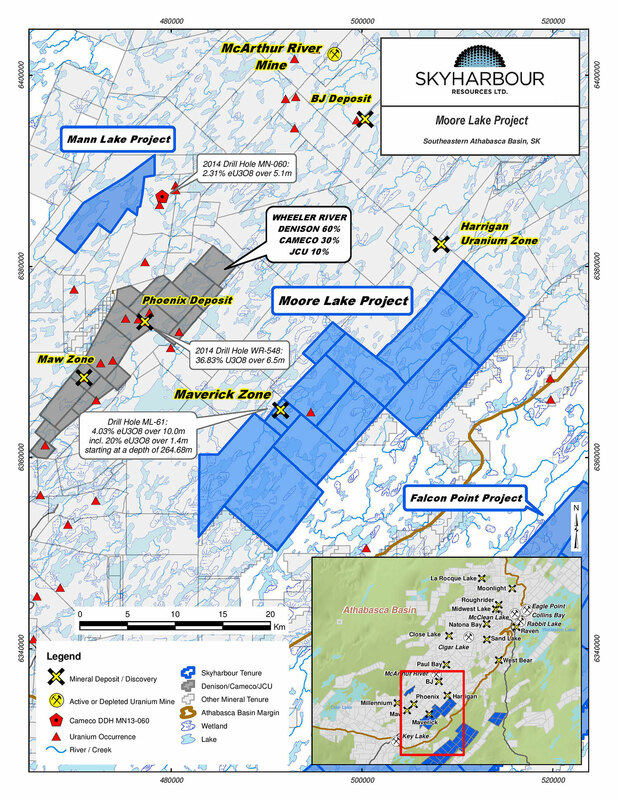 The Moore Lake Uranium Project consists of 12 contiguous claims totaling 35,705 hectares located 42 kilometres northeast of the Key Lake mill, approx. 20 kilometres east of Denison's Wheeler River project, and 39 kilometres south of Cameco's McArthur River mine. 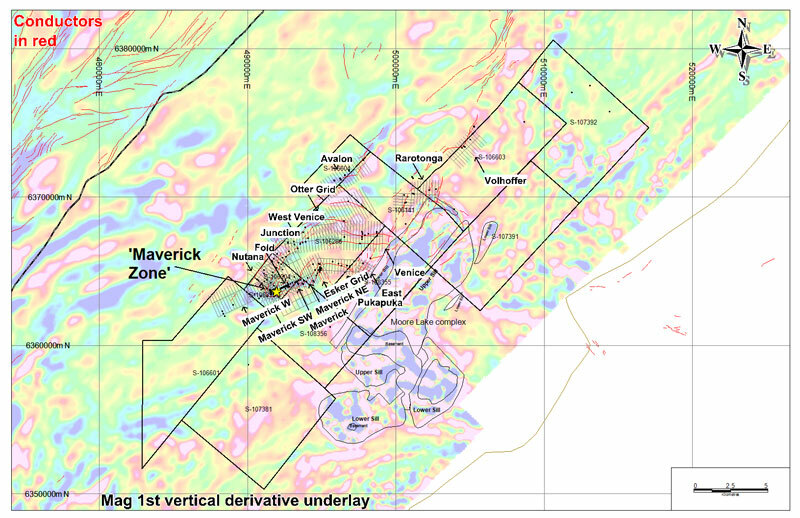 Unconformity-hosted uranium mineralization was discovered on the property at the Maverick Zone in 2002 and several high grade intercepts have been drilled since. Drill hole ML-61 contained the best result drilled on the property to date, which returned 4.03% eU3O8 over 10 metres, including 20% eU3O8 over 1.4 metres, starting at a depth of 264.68 metres. Drill holes ML-55 and ML-48 also encountered high-grade mineralization, returning 5.14% U3O8 over 6.2 metres, and 4.01% U3O8 over 4.7 metres, respectively. The depth to the unconformity on the property is relatively shallow, with the thickness of the sandstone cover varying from less than 125 metres on the property's eastern side to over 325 metres on the property's northwestern side. Basement rocks are predominantly paragneisses belonging to the Wollaston Domain. A large mafic sill known as the "Moore Lake complex" partially overlies a portion of the eastern side of the property. The property has been the subject of extensive historic exploration with approx. $30 million in expenditures, and over 132,000 metres of diamond drilling completed in 370 drill holes. The project is accessible via ice roads from the McArthur River mine haul road and float or ski equipped aircraft. Since 1969, the property has undergone episodic exploration by several companies including Noranda, AGIP, BRINEX, Cogema, Kennecott/JNR Resources and IUC/Denison. In April of 2002 the Maverick Zone was discovered and in the fall of 2003, International Uranium Corporation, who then merged with Denison, optioned 75% of the property from JNR and took over operatorship. Subsequently Denison acquired the remaining 25% interest from JNR for an undivided 100% in February of 2013, when it acquired all of the outstanding shares of JNR. Skyharbour's head geologist and director Rick Kusmirski was the President and CEO of JNR Resources during that time. Exploration programs carried out on the project lands include an assortment of airborne and ground electromagnetic and magnetic surveys, ground gravity, seismic, IP/resistivity and geochemical surveys, mapping, prospecting, lake sediment sampling programs and the drilling of some 325 diamond drill holes. From mid-2000 onwards, the primary focus of exploration has been the 3.5 kilometre long Maverick structural corridor where pods of high grade unconformity-type uranium mineralization have been intersected. The best intercepts to date were obtained from drill holes testing the southwestern portion of this corridor. The potential of intersecting additional mineralization along this corridor is very good and as such it will continue to be a high priority target area. Also of note is that both basement and unconformity-type uranium mineralization have been intersected in a number of underexplored target areas on the property. Skyharbour's Head Technical Advisor and a Director, Rick Kusmirski commented: "I've always considered the Moore Lake Project to be one of the most geologically prospective exploration projects in the Basin, with the potential to host a sizeable high grade uranium deposit. JNR made the initial high grade discovery at the Maverick Zone and after a number of years we sold the project and company to Denison. I am very excited to get back to work on this project with the Skyharbour team. In addition to the Maverick structural corridor, which still has a number of targets that are untested and require follow-up, there are at least nine other target areas throughout the property that contain well defined and extensive conductive systems. The nominal amount of drilling that was carried out in these areas intersected well defined structures associated with multiple graphitic lithologies. Analysis of the drill core returned highly anomalous geochemistry, including uranium mineralization in seven of the target areas." The Company is pleased to announce that David Cates, President and CEO of Denison and Uranium Participation Corp. (TSX:U), will be joining Skyharbour's Board of Directors. Mr. Cates is a Chartered Professional Accountant (CPA, CA) and holds Master of Accounting (MAcc) and Honours Bachelor of Arts (BA) degrees from the University of Waterloo. Prior to his appointment as President and CEO of Denison, Mr. Cates served as Denison's Vice President Finance, Tax and CFO. As CFO, Mr. Cates played a key role in the Company's mergers and acquisitions activities - leading the acquisition of Rockgate Capital Corp. and International Enexco Ltd. Mr. Cates joined Denison in 2008 and held the position of Director, Taxation prior to his appointment as Chief Financial Officer. Prior to joining Denison, Mr. Cates held positions at Kinross Gold Corp. and PwC LLP with a focus on the resource industry. As part of the Option Agreement, Denison is entitled to nominate a member to Skyharbour's Board of Directors, so long as Denison maintains a minimum ownership position of 5% in the Company. Denison's President and CEO, David Cates commented: "Denison is continuing to focus its efforts and budgets on the Company's flagship Wheeler River project - which is in the process of advancing from a successful Preliminary Economic Assessment to a Prefeasibility Study together with extensive exploration focused on delineating new and existing resources. Partnering with Skyharbour is the perfect way to ensure Moore Lake continues to be explored for potentially significant mineralization. While Denison wasn't actively looking to sell its position in the Moore Lake property, we couldn't pass on an opportunity to join forces with the dynamic leadership team at Skyharbour and their strong will to take Moore Lake through the next phase of exploration." Once Skyharbour acquires its 100% interest in the property, Denison may exercise a buyback option ("Buyback Option") to repurchase a 51% interest in the property by making a cash payment of $200,000 and spending $6,750,000 in exploration expenditures on the property over the following three year period. The parties would then form a joint venture. If Denison fails to complete the Buyback Option, Skyharbour would retain 100% ownership in the property. Provided this first Buyback Option is not exercised by Denison, Skyharbour would own 100% of the property and would have an additional five year period to incur an additional $3,000,000 in exploration expenditures on the project ("Additional Expenditures"). At this point, Denison may elect to exercise a second buyback option to repurchase a 51% interest in the property by making a cash payment of $500,000 and spending $16,500,000 in exploration expenditures on the property over the following four year period. The parties would then form a joint venture. If Denison fails to complete this second buyback option, Skyharbour would retain 100% ownership in the property. Skyharbour has received board approval for the consolidation of the Company's issued and outstanding share capital. The intended consolidation will be on a basis of one post-consolidation common share for every four pre-consolidation common shares. This consolidation will reduce the issued and outstanding shares of the Company from 89,043,594 (pre-Moore Lake Option Agreement) to approximately 22,260,890 shares, assuming no other change in the issued capital. Skyharbour's outstanding options and warrants will also be adjusted on the same basis (4 for 1) as the common shares, with proportionate adjustments being made to exercise prices. The Company does not intend to change its name or its current trading symbol in connection with the proposed share consolidation. The consolidation is subject to approval by the TSX Venture Exchange. Richard Kusmirski, P.Geo., M.Sc., Skyharbour's Head Technical Advisor and a Director, as well as a qualified person, has reviewed and approved the technical aspects of this news release and is the Qualified Person as defined by National Instrument 43-101. All historical results regarding the Moore Lake Uranium project have come from publicly disclosed information and Rick Kusmirski, a Director of Skyharbour, was the President of JNR Resources during the relevant period. Skyharbour holds an extensive portfolio of uranium and thorium exploration projects in Canada's Athabasca Basin and is well positioned to benefit from improving uranium market fundamentals with five drill-ready projects. In addition to the Moore Lake Uranium Project Option, the Company owns a 100% interest in the Falcon Point (formerly Way Lake) Uranium Project on the eastern perimeter of the Basin which hosts an NI 43-101 inferred resource totaling 7.0 million pounds of U3O8 at 0.03% and 5.3 million pounds of ThO2 at 0.023%. The project also hosts a high grade surface showing with up to 68% U3O8 in grab samples from a massive pitchblende vein, the source of which has yet to be discovered. Skyharbour has a 50% interest in the large, geologically prospective Preston Uranium Project proximal to Fission Uranium's Triple R deposit as well as NexGen Energy's Arrow deposit. The Company's 100% owned Mann Lake Uranium project on the east side of the Basin is strategically located adjacent to the Mann Lake Joint Venture operated by Cameco with partners Denison Mines and AREVA, where high-grade uranium mineralization was recently discovered. Skyharbour's goal is to maximize shareholder value through new mineral discoveries, committed long-term partnerships, and the advancement of exploration projects in geopolitically favourable jurisdictions.